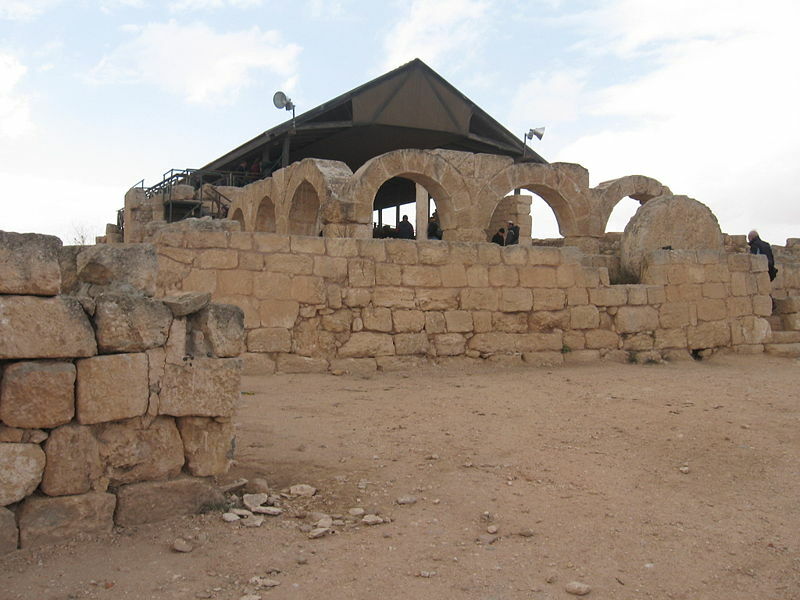 A specious Arab "historic connection" to a spot with clear archaeological evidence of Jewish life is contradicted. In land disputes with Israel, Arabs often claim their "historic rights" to almost every part of Israel, often repeating the mantra that their grandfathers had lived on a given tract of land "for centuries"
In that context, a new controversy has erupted over whether or not the Israel civil administration, which administers the Judea region of the "west bank", will indeed demolish the Arab hamlet of Susya. [Susya is south of Hevron, on the road towards Be'er Sheva]. As the debate has grown more heated, Israeli groups that advocate for Arab territorial rights have distributed their version of a history of Arab Susya, as a reason to justify the inherent Arab right to settle in Susya, since they have no permit or authorization whatsoever from the Israel Civil Administration. 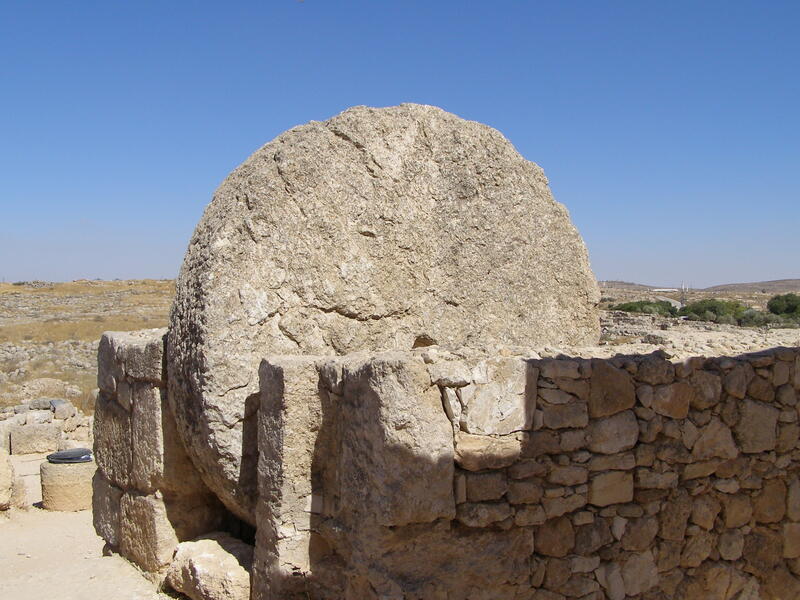 Rolling stone from ancient synagogue in Susya. Since the claim made by the advocates of Arab Susya focuses attention only on that "historic claim" made by those Arabs, it might be appropriate to ascertain what the Ottoman and British records would attest to that claim. A check with the researcher and Jerusalem Post journalist Dr. Seth J. Frantzman, co-author of "Bedouin Settlement in Late Ottoman and British Mandatory Palestine: Influence on the Cultural and Environmental Landscape, 1870-1948" was made in order to ascertain what the Ottoman and British records show about Susya. Dr. Frantzman carried out his Ph.D. research at the Hebrew University, using Israel State Archives and the map archives of the Hebrew University and National Library as well as at the aerial photo archive of the Hebrew University's Geography department, on the foundation, expansion and development of Arab villages in the 19th and early 20th century, tracing how some villages expanded and gave birth to "daughter villages"
Dr. Frantzman notes that, in his research, he did not come across any village, hamlet or settlement at Susya. He did identify several other villages that were founded in the 1940s, which Professor David Grossman of the Department of Geography at Bar Ilan Unversity has also written about. For example, the village Rahiya, near Yatta, was founded in the late 19th century or early 20th century. Yet there is no evidence, however, from records examined at Ben Gurion University from the Ottoman Empire period or British mandate period, of any village or settlement ever existing at Susya. THE PALESTINE EXPLORATION FUND, which carried out a thorough and widely respected survey of the country from 1871-77 did not show any village or settlement in the area of Susya. Instead they noted only the ruins of ancient Susya, which was a Jewish town from the Temple period with a synagogue facing Jerusalem, ritual bath and other artifacts. Their map and memoirs both indicate only a ruin. Had there been a village it would have been indicated the way Samu was on the map. Later maps from the British Mandate period, from 1942 and 1948, show no village in the area of Susya, but once again show villages at Samu and Yatta. An aerial photo from 1945 does not show a village or even tents at the site. In short, the conclusion of Dr. Frantzman's study is that there was no settlement at Susya, no village and no houses from the 19th century through 1948. While Arab Susya's advocates, writing in various publications, claim to have lived in a "village" at the site since the 1830s, there seems to be no record of any such "village". Dr. Frantzman noted that, in his words, "It is surprising that so little was constructed from the period 1830-1948". Photos from today show construction that is likely much more modern. Dr. Frantman observed that "The allegation that the villagers were prevented from building or 'built illegally' in Area C begs the question, didn't they build anything before Area C was created in the 1990s? Where are the old houses from 1830, from 1920, 1940, 1960, 1970? Was not the settlement in fact a seasonal settlement of tents and non-permanent dwellings?" These are the questions that should be raised. More evidence in the way of photos from the 1960s and after that would surely shed light on this. 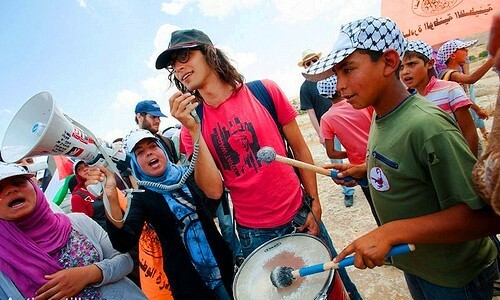 Over the past ten days, our agency dispatched a reporter to ask advocates of Arab Susya if they could provide any documentation which would support the claim that "The village of Palestinian Susya has existed for centuries, long before the establishment of the [Jewish] settlement of Susya in 1983. There are documentary evidence of a settlement in the area dating back to 1830, and it is also marked on British mandatory maps from 1917"
No one could provide any such evidence. In other words, the issue at hand today revolves around whether the Israel Civil Administration is legally mandated to demolish homes of Arabs that were built without authorization and without any permit in Judea. Over the past few years, the Israel Civil Administration has destroyed hundreds of Jewish homes because they were built without a permit recognized by the Israel Civil Administration, despite historic claims of Jews to the land where they had made their home. And who can forget the Oct. 27, 2004 decision of the government of Israel to revoke permits for settlement in Gush Katif and four Jewish communities in Northern Samaria, which resulted in the demolition of all 21 Jewish communities in Gush Katif and all four Northern Samarian communities. In other words, the precedent for Susya's demolition has been established by the stringent way in which the Israel Civil Administration has applied the letter of the law to Jewish communities in Judea, Samaria and Gaza. Meanwhile, the record shows that claims by Arabs to precedence in Susya are specious.